Tropical Storm Greg is intensifying after absorbing the moisture from the remnants of former Tropical Depression 8E. NOAA's GOES-West satellite captured an image of Greg as it moves west in the Eastern Pacific. NOAA's GOES-West satellite captured an infrared image of Greg on Friday, July 21, 2017 at 8 a.m. EDT (1200 UTC). 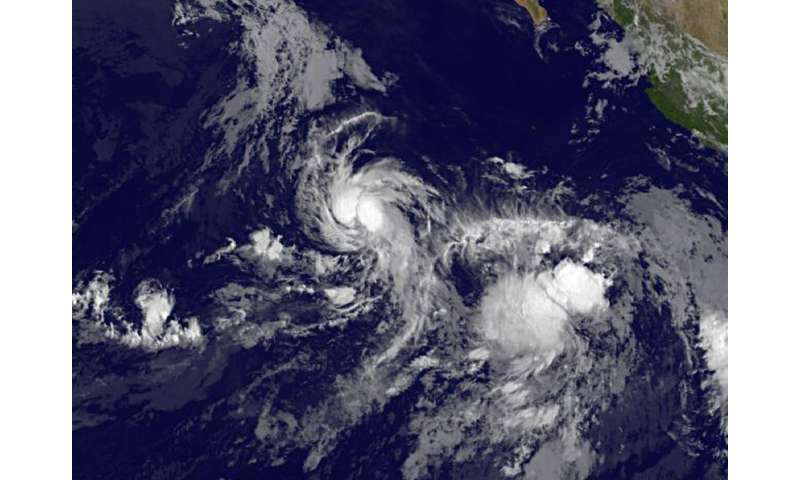 The image showed two large areas of convection in Greg with a band of thunderstorms spiraling into the low-level center from the north and south. Located to the southeast of Greg are an amorphous area of clouds from the remnants of Tropical Depression 8E. The National Hurricane Center (NHC) issued an advisory on the storm at 11 a.m. EDT (1500 UTC) and noted that the center of Tropical Storm Greg was located near 15.1 degrees north latitude and 119.2 degrees west longitude. That's about 810 miles (1,305 km) southwest of the southern tip of Baja California, Mexico. Greg was moving toward the west-northwest near 10 mph (17 kph) and NHC expects a continued westward to west-northwestward motion with a slight increase in forward speed through the weekend. Maximum sustained winds have increased to near 60 mph (95 kph) and Greg is forecast to become a hurricane by Sunday, July 23.